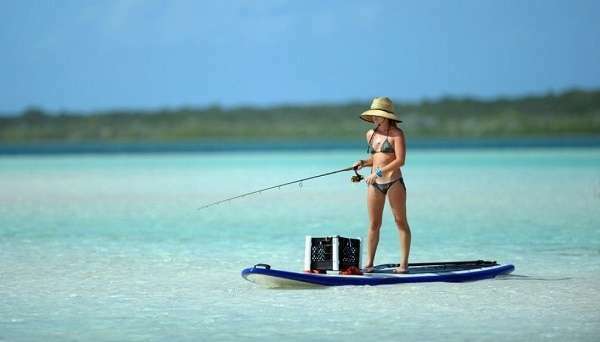 Fishing holds a reputation as a family-friendly and healthy recreational activity, according to the Health Fitness Revolution, so there?s no reason you shouldn?t glean the benefits of both paddle boarding and fishing at the same time. Here we?ll discuss why you should try paddle board fishing and how to get started. What Is Paddle Boat Fishing? Paddle boat fishing is exactly what it sounds like: fishing from your paddle board. While a paddle board is, admittedly, not a boat, there?s nothing stopping fishers from casting their reel from atop their board. Today?s boards use modern technology and advanced materials to form impressively stable and functional floating platforms. Whether you use an inflatable paddle board or a solid construction version, once you become comfortable balancing and paddling on your board, it becomes easier to manage other tasks. If you have never paddle boarded before, you may experience a slight learning curve as you adjust to fishing from a standing position astride your floating deck. 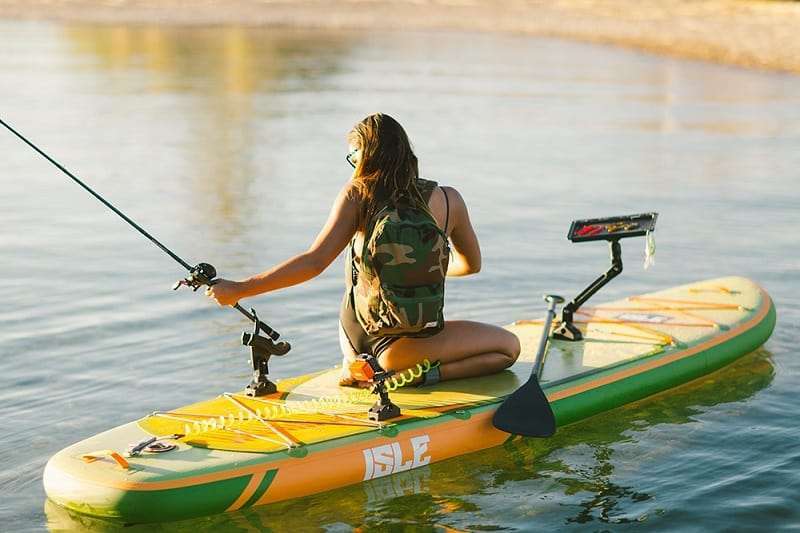 However, once you grow accustomed to maneuvering your paddle board with a rod in hand, you?ll see the benefits of fishing onboard a SUP versus a kayak, boat, or another vessel. You might install a waterproof camera and take video or photo while paddling or bring along a picnic lunch for later. You may even load up a waterproof pack and carry your paddle board to a remote location with water-only access for camping. So why not fishing, too? Is It Possible To Fish With SUPs? The answer is yes if you can maintain your balance. But for most paddle boarders, this is not a challenge. In fact, standing upright gives you more control over your rod, especially when reeling in a hefty catch. If you already have a larger SUP, you can probably fit at least a small amount of gear onboard. Or, you might choose to upgrade so that you and a friend can fish together. If you are looking to purchase a fishing paddle board, consider how much you want to spend and what size board you want. The larger the board, the more space you?ll need to pack and store it, but the more surface area you?ll have for fishing from. Another important consideration is whether you?ll choose an epoxy board or an inflatable one. Inflatable boards are easier to transport since you can deflate and stow them away in a pack or case, while solid construction boards are bulky and more difficult to manage on long treks to the water. Whether you?ve tried kayak fishing already or not, fishing from a SUP is a unique experience all its own. When you?re comfortable balancing on the board, it?s not too much of a stretch to cast your rod from the surface of the board. Plus, your SUP is likely much lighter and easier to carry than a kayak, even if you have an epoxy model. If you have an inflatable paddle board, even better. In comparison with a kayak, a paddle board provides a better view of the water, so you can see where the fish are in the more shallow water. You can also pursue your prey in near silence since your SUP can move quickly and quietly. Often, successful fishing depends on how stealthy you are, and paddle boards deliver on that account. It?s also easier to quickly grab a paddle and move the SUP, versus getting in position to row a kayak. When you?re ready to take your SUP fishing board out for its first spin, it?s smart to heed the advice of seasoned fishers who have used paddleboards for fishing before. Here are a few helpful tips if you?re new to taking stand up paddle boards fishing. You don?t want to overload your paddle board with too much gear, so think about the weight limit and decide what you absolutely must take along, and what can stay behind. Depending on the length of your fishing trip, you?ll likely want water, sunscreen, and bait. Consider the basics and aim for a short first few trips to get acclimated. If you haven?t purchased a board yet, look at a spec comparison like Isle Surf and Sup?s to determine the capacity and fit of a board. Decide where you?ll enter and exit the water and plot any other exit points so that you have a way out of the water. Another aspect of smart planning is bringing along appropriate safety equipment, Take Me Fishing notes, such as a floatation device, cell phone or radio, and a safety whistle. Keep your reel prepped for action, and don?t plan on switching out lines or your fly while on the water. Especially if you?re new to paddle board fishing, aim for the least amount of work on the water as possible.